Eastern junior Derrick Metheney (center) is guarded by Point Pleasant sophomore Hunter Bush (23), during a non-conference bout on Jan. 22 in Tuppers Plains, Ohio. NELSONVILLE, Ohio — Bad breaks on the road continue. The Eastern boys basketball team — fresh off back-to-back home wins —suffered its third straight one-possession loss on the road in Athens County on Saturday, falling to non-league host Nelsonville-York by a 53-52 tally. Eastern (9-6) — now 3-2 outside of the Tri-Valley Conference Hocking Division this season — fell behind 15-to-9 after eight minutes of play. The Eagles got two points back in the second quarter, outscoring the Buckeyes (7-10) by a 14-to-12 count to make the Nelsonville-York advantage 27-23 at halftime. The guests were in front by a 39-36 tally at the end of the third period, as the Eagles went on a 16-to-9 run featuring seven field goals in the quarter. Eastern scored a dozen points over the final eight minutes, but the hosts tallied 17 and slipped away with the 53-52 win. 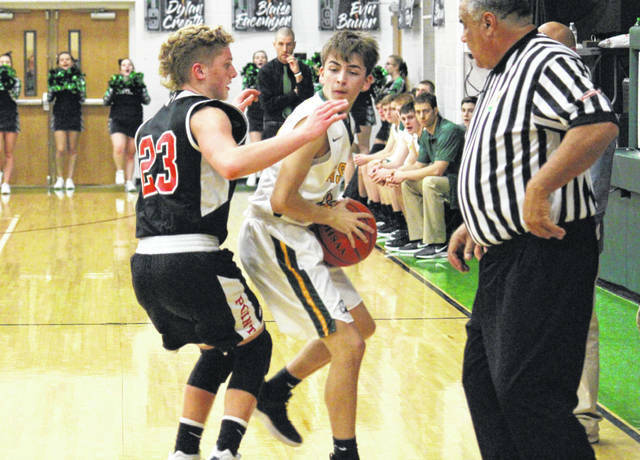 The Eagles made 22 field goals, including a trio of three-pointers in the contest, while NYHS sank 23 field goals, including a quartet of triples. At the foul line, Eastern was 5-of-8 (62.5 percent), while Nelsonville-York was 3-of-7 (42.9 percent). EHS senior Isaiah Fish led the guests with 11 points, featuring five field goals and one free throw. Next was Colton Reynolds with 10 points, including three from beyond the arc. Garrett Barringer finished with eight points for the Eagles, while Mason Dishong came up with seven. Blaise Facemyer and Ryan Dill both ended with five points, with a three-pointer apiece. Derrick Metheney scored four points for the guests, while Sharp Facemyer rounded out the team total with two markers. NYHS senior Ethan Bohyer led all-scorers with 18 points on the strength of eight field goals. Mikey Seel and Justin Perry were next with eight points apiece, followed by Bryce Richards with seven and Reece Robson with six. Ethan Gail contributed four points to the winning cause, while Chris Beyette chipped in with two. Eastern will try to cure its road blues when the Eagles return to TVC Hocking action at South Gallia on Tuesday.